Researchers from the University of Delaware and Washington University in St. Louis have figured out how to train synthetic polymer molecules to behave--to literally “self-assemble” --and form into long, multicompartment cylinders 1,000 times thinner than a human hair, with potential uses in radiology, signal communication and the delivery of therapeutic drugs in the human body. Darrin Pochan, associate professor of materials science and engineering at the University of Delaware, and Karen Wooley, the James S. McDonnell Distinguished Professor of Arts & Sciences at Washington University in St. Louis, led the research effort, which also involved co-authors Honggang Cui, a recent doctoral graduate, and doctoral student Sheng Zhong at UD, and Zhiyun Chen, a doctoral advisee of Wooley's. 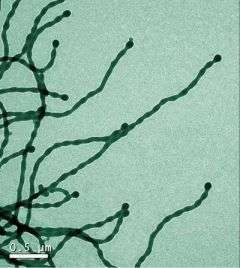 The focus of the research was block copolymers, which are synthetic molecules that contain two or more chemically different segments bonded together. Block copolymers are used to make a variety of materials such as plastics, rubber soles for shoes, and more recently, portable memory sticks (“flash drives”) for computers. “In the world of self-assembly for nanotechnology, it's challenging to make something other than the shape of a ball,” Pochan noted. “If you put little balls full of a drug into the bloodstream, the body's organs and immune system will get rid of them in around a day. But if you place the molecules into long, floppy cylinders, they may stay in the body for weeks,” Pochan noted. “Moving from a sphere to a cylinder, you could conceivably deliver two or three or four different drugs in one injection, one to one part of the body and others to other parts of the body all through the same self-assembly,” he said. Although the research is far from practical applications, the team's discovery has yielded a new, fundamental “bottom-up” technique for building nanostructures. “I'm now building on stuff I did in grad school in the '90s on rubber and plastics,” he said. “However, if you look at block copolymers as a tool for self-assembly, there are many more potential applications than rubber for your boot or plastic coating for your floor,” he noted.